On most days, I am seen wearing yoga pants and a long sleeve shirt, but every so often, I don't want to look frumpy and decide to dress up. How do I do this? Maxi skirts: I like how I'm able to move at ease while wearing them and not feel like I might be showing too much leg. I prefer wearing a basic black skirt; this way I'm able to dress it up and where it for future pregnancies when other styles may have gone out. Another plus is that you're often able to wear them when not pregnant. Cardigans or a jean jacket: I have found that it is essential to layer. Hello hot flashes. Or so it seems. I used to laugh at my mother when she had hot flashes, but now I am much more sympathetic towards her and others. Scarves: I did this during my first trimester a lot when it was not common knowledge that I was pregnant. I wanted to try to "hide" my belly. Now I do it to add more layers that can be easily taken off. I can also wear it postpartum when I'm breastfeeding. Belts: They helps show your "bump" more and others realize that I am actually pregnant, as opposed to just being big. Choose tops while thinking ahead: If you plan on breastfeeding think of tops the will help, such as ones that button down or tops that you can easily pull down or pull up. 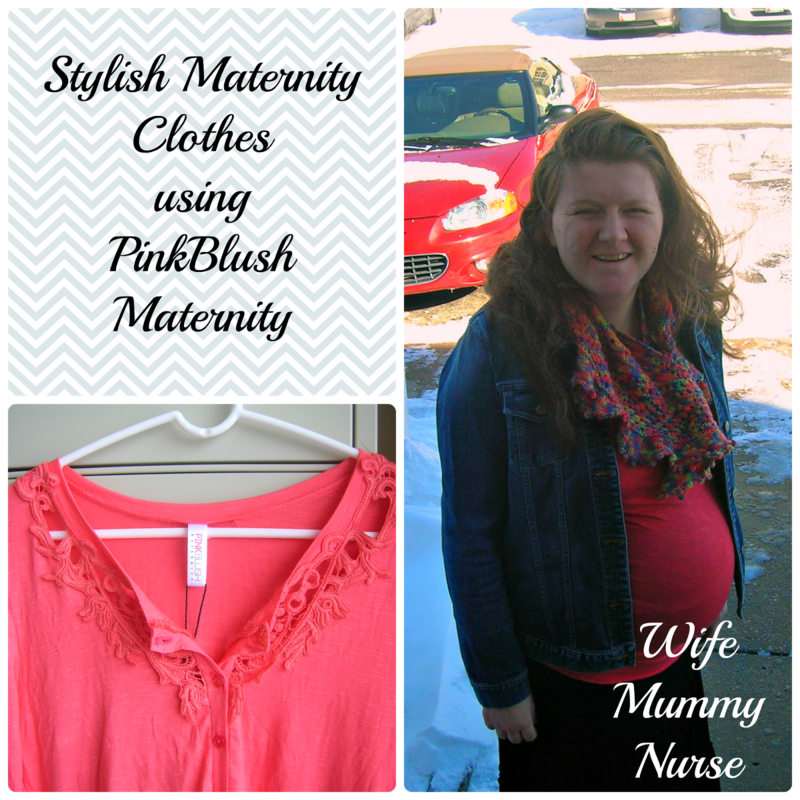 PinkBlush maternity sells stylish maternity and nursing clothes,while remaining inexpensive compared to other brands. I was sent the coral crochet neckline maternity/nursing top for review. Upon getting it, I immediately loved the drape and liked the fact that it did not cling too much. I also liked the fact that it was long and had buttons at the top for breastfeeding Lil' J once he arrives. When I first put it on, Drew said, "You look really nice." Unfortunately, I did not pay attention to the washing instructions which are to "Hand Wash Cold, Hang Dry." I think it would have been fine washing it on cold, gentle cycle, but I washed it regularly with hot water. Let's just say, it shrunk and is now too tight on me. What is your favorite item from PinkBlush Maternity? I received an item from PinkBlush Maternity in exchange for this review. I'm loving your redesign AND your bump is super cute! Thanks so much; I've been wanting to get my blog redesigned for almost a year, but had no clue where to start. Jamie from Clueless Momma Designs did it. That's a really pretty shirt and I love how you paired it with the denim and the scarf! Thanks. I LOVE layering my clothes these days. Very cute outfit! I love the ide aof really using accessories to your advantage seems how you are more likely to have lots to pick from seems how you can use the ones you had pre-pregnancy. These are great tips! I was a totally unstylish pregnant woman, lol. Although I did dress up once for a wedding...two days before my son decided to enter the world early. You look fantastic. Love the scarf! First, congratulations. I have been so out of the loop since the baby was born that I totally did not know you were expecting. Wonderful. Charis will be a great big sister. Enjoy! And you look great. As for me, I was fairly stylish this last time having a neighbor about my size who loaned me all her stuff. Nice stuff. I never wore the same thing to work once. They have some really amazing, high quality, stylish maternity clothes. I love staying up to date with their newest styles even though I'm not pregnant yet. Thanks for the review! I'm usually pretty good about wearing skirts/dresses when we go out, but yoga pants are so nice for at home. lol!